Several days ago I noticed something wasn’t quite right with my eleven- year-old daughter as she disembarked from the school bus. Her customary care free gait was replaced by slumped shoulders and deliberate steps toward our home’s patio. “What’s wrong?” I offered with a worried glance. She immediately began to cry hysterically and the sobbing continued inconsolably for the next two hours. What was the source of this devestating display of pre-teen angst? She had failed a math test. For the duration of her suffering I stared in disbelief as she explained that her life was ruined forever. How she was no longer “good” at math, and would lose her perfect A+ average. How there was no way she would get into seventh grade honors math which would lead to a terrible domino effect. This would mean no high school level math in middle school and that would mean no Calculus AP in high school. Without that Calculus class her dream of going to MIT and becoming an aerospace engineer was lost for all eternity. When did sixth grade become so stressful? Our students in Innovation Lab are not free from stress either, both inside and outside of school. There are sports to be played, baby brothers to watch, and community service events to attend. Students have been hard at work putting finishing touches on STEM water filtration projects that were developed over the better part of this first marking period. But as my colleague, Brian Walach, pointed out as we collaborated in our common room, there is good stress and there is bad stress. Our goal is not to create students who are completely stress free; that would lead to complacency and lethargy. We want to foster good stress; the kind that makes a student care deeply about completing the best project possible, and keeps them motivated even when they hit the most difficult obstacles. The bad stress is the kind that paralyzes a sixth grader into thinking that one mistake will lead to life long failure. Last week our students had their first taste of Carol Dweck’s philosophies on growth mindset. Dweck spent years studying all ages of students. What she discovered was that those who refused to give up in the face of challenge were the most successful academically. Dweck also noticed that certain adult behaviors could help or hinder a student’s willingness to accept a challenge. Shockingly, she found that well meaning praise for getting a correct answer or a high grade actually lowered a student’s likelihood to take chances; the fear of failure was exacerbated by the praise for success. Some students, however, explained it was hard not to get sucked back into a fixed mindset, especially when they faced this culture outside of Innovation Lab. They felt pressure from many different sources to get “A’s” and believed that their parents would be disappointed with anything less. During the discussion I asked the students to think about ways that we teachers could further support them in achieving growth mindset. At this one of our students pointed out that even the teachers in Innovation Lab need growth mindset to make it work. Challenges certainly do not end with childhood. As the students settled down to their work, and Mr. Klar returned for the rest of our meeting, I realized the most crucial part about giving students a growth mindset. Even after tests, and grades, and proms are finished, the resilience they acquire will carry them through countless trials. If we give students the right tools, they will weather through not only failed tests but substitute teachers, sports injuries, lost jobs, and whatever else life might throw at them. Growth mindset prepares you for life. Shouldn’t that truly be the aim of any education? 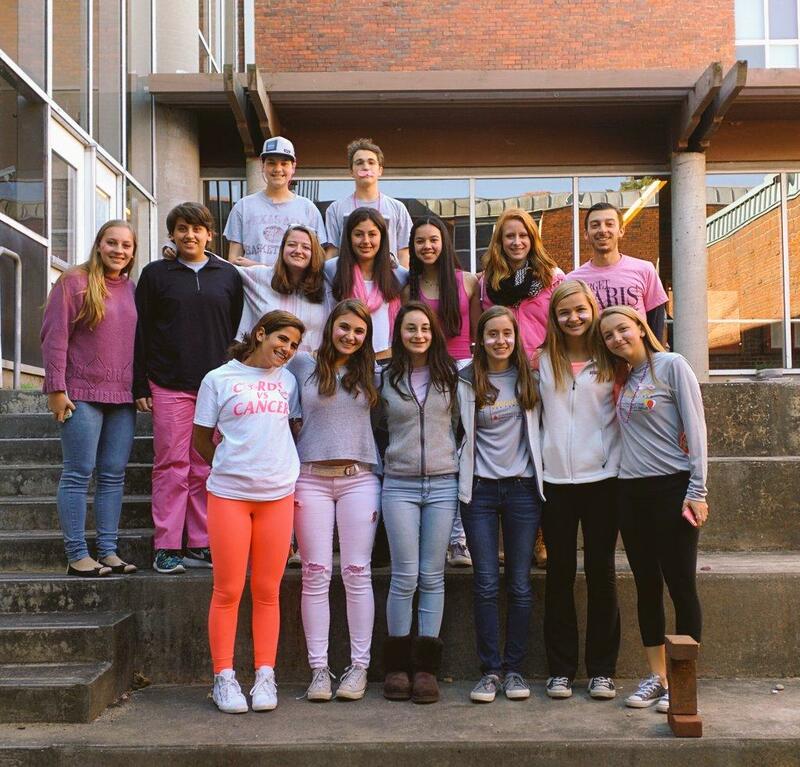 Some of our students posing with Mr. Walach on Friday, dressed in support of breast cancer awareness.